SMYRNA, Tenn. -- At points along the assembly line at Nissan Motor Co.'s largest U.S. factory, workers wheel trolleys past shelves selecting parts wherever they see a green or blue light. Consumers around the world are shifting rapidly away from traditional sedans in favor of crossovers and SUVs. The recent rise in U.S. gasoline prices is a reminder that a more serious oil price shock could make smaller vehicles popular again. Trade tensions and tariffs threaten companies that ship significant numbers of vehicles from one country to another. Nissan and rival Japanese automakers Honda Motor Co. and Toyota Motor Corp. have been the best at flexible manufacturing, auto experts and industry executives said. Historically, Japanese automakers focused on interchangeable processes and platforms out of necessity -- because one model for the Japanese market could not sustain an entire factory. U.S. and European automakers have worked to catch up. For example, Ford Motor Co.’s Kentucky truck plant makes some of its best-selling pickup trucks and large SUVs on the same platform, and is expected to hit full capacity this year. But General Motors illustrates some of the pitfalls of relying on single models. While The No. 1 automaker’s U.S. plants producing popular pickup trucks are running around the clock to meet demand, others that make a single car model are running well below capacity. Honda’s assembly factory in Greensburg, Ind., started operation in 2008 building Civic sedans, and later a small sedan for the Acura brand. Last year, as sedan sales weakened and demand for SUVs soared, Honda decided to add production of its compact CR-V compact crossover at Greensburg. Instead, McCurdy and other engineers separated the hood welding line from the Civic trunk and CR-V tailgate welding system, reusing many of the robots. The plant bought 10 more welding robots -- fewer than originally proposed. During a planned production week-long shutdown, workers reconfigured the area of the welding shop. 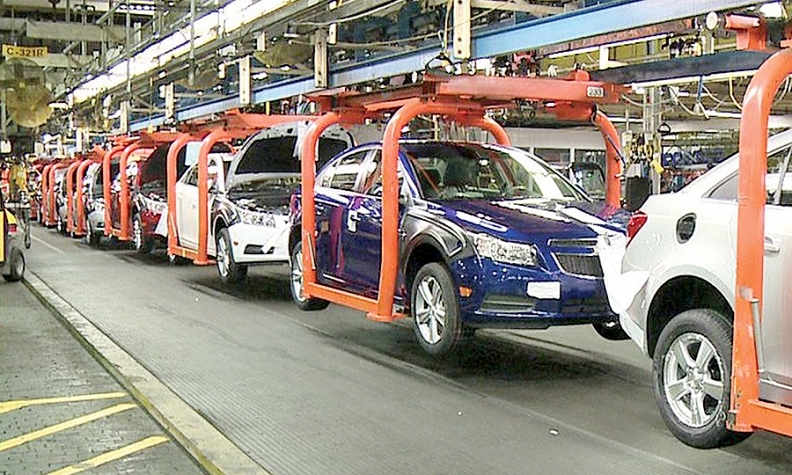 The Nissan plant in Smyrna has two lines that can each produce 60 vehicles an hour. The plant’s 8,000-plus workers make six different vehicles on two production lines here -- three SUVs and three cars, including Nissan’s best-selling, higher-margin Rogue crossover. Last year Smyrna made 623,000 vehicles, more than 97 percent of its capacity, and it is running over 90 percent now.